Growing up, my family always had a little farmers market. Though, the farmer was my dad and the market formed when my brother and I exchanged our weeding efforts for our allowance. We had a seemingly never-ending supply of fresh and tasty veggies. While I didn’t think of it at the time (or really value it, for that matter), those veggies were always grown with care, picked just before eating and served with a healthy side of conversation and antics. When I moved away from home and to a big city, I lived in an apartment and didn’t have the luxury of a veggie patch. I guess, initially, it was a combination of my love for food and my desire to eat healthier that drew me to a Farmers Market. As time went on, I developed an appreciation for Farmers Markets and found myself visiting them more and more, making a visit a part of my weekly routine. After leaving big city life behind in 2013 (and feeling a little displaced because of it), you can imagine how delighted I was the first time I visited the Fredericton Boyce Farmers Market. Ok, maybe you can’t imagine, as you probably don’t know me. But let’s just say it was fairly synonymous with a kid in a candy store. The sights, the smells, the smiling faces; it was a full sensory experience in the very best way. As a first-time visitor, I really enjoyed simply walking around the market. I liked seeing the vibrant colours of the fruits and veggies stacked high, taking in the delicious and intriguing smells wafting from the food vendors and discovering the eclectic mix of goods available from local artisans. I liked exploring the Fredericton community through the Market offerings. Mostly, I enjoyed being immersed in the ‘hum’ of the city. Now, as a weekly Farmers Market regular, I still enjoy all of the sights and smells that I experienced on that first visit. I love purchasing fresh fruits, veggies, breads, cheeses and meats and letting them be the inspiration for my meal ideas. And I really love treating myself to lunch at the Market; the offerings are so diverse and the food is so yummy. I love chatting with the suppliers, getting to know a little more about their products and what drives them to do what they do. I like finding new vendors; it seems like I discover a new one every week. I like contributing to the local economy and supporting local entrepreneurs. More than anything, I love feeling like I’m a part of the Fredericton community and being an active part of that city ‘hum’. 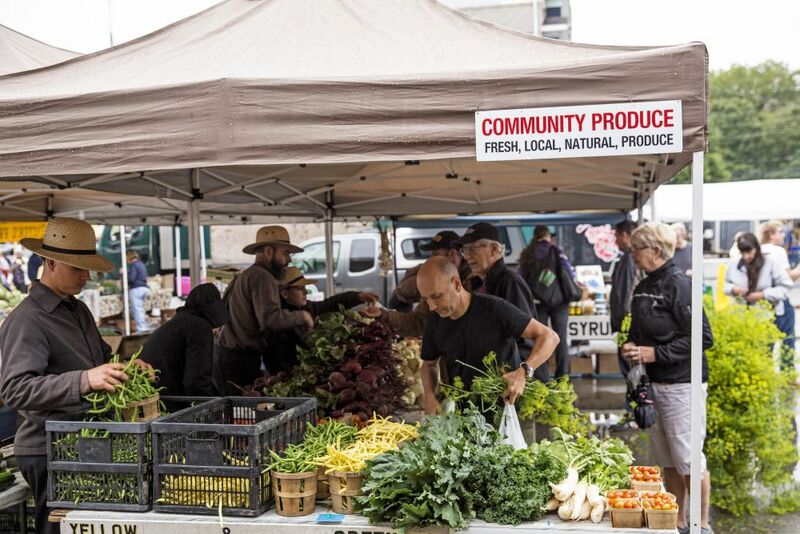 So whether you’re a visitor or a local and whether you’re looking for farm-fresh fruits and veggies, tasty treats, handcrafted gifts, a little insight into the Fredericton community or simply a good chat, you should check out the Fredericton Boyce Farmers Market, open 6am-1pm Saturdays in Downtown Fredericton.